Here's a quick Thai marinade, perfect for a tiger prawns on a BBQ or on a griddle pan. Barely a recipe really. Would work well with other seafood e.g squid or a whole fish like snapper or something. Start by pounding the peppercorns, then chop the lemongrass and throw that in with pinch of sea salt (seasons and helps with pounding-down process), crush until quite fine, now add your garlic and coriander roots, pound again, finally chop up the chillies and turmeric and add them, pound again. When it's all well smooth-ish add a tablespoon or so of fish sauce and pinch of white sugar, mix, and it's ready. Prep your prawns. In the pic I've removed the shell from the body but left the tail and head on, but I often just leave the shell on as it stops them from drying out. Either way you want to remove the vein - if peeled then do this by cutting down the back to expose vein and pull it out, if you want to keep shell on then hook the vein out with a skewer or toothpick. Now rub the prawns all over with the marinade and leave to marinate for at least an hour, several hours is better. When you're ready to cook grill them until charred and just cooked on you BBQ, probably 2 mins on each side. 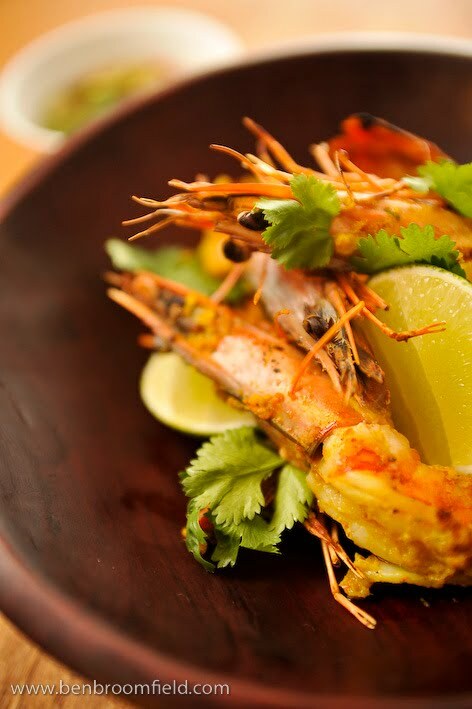 Serve with coriander and lime pieces to squeeze over, plus, if you like, a little bowl of fish sauce and lime juice with a sliced chilli in ("prik nahm pla") or a bought chilli sauce like siracha. Thanks to Ben for the pic. mmm...sounds just perfect and do-able - thanks! Agree that this sounds like a nice do-able recipe. Sounds great. Will be sure to give this one a go!